Keith Watson in action for Hartlepool United. Keith Watson’s knee injury is expected to see him sidelined for THREE months, according to St Johnstone boss Tommy Wright. But instead of taking the defender back, Wright has full faith in Hartlepool United’s medical staff to look after the 27-year-old Scot. Watson has been absent since hobbling off in the closing stages of Pools rearguard action at Leyton Orient. And although fears had been that the former St Mirren and Dundee United man’s spell at Victoria Park would be over, with his loan up in January, that appears not to be the case with Wright leaving the rehab up to Pools medical staff rather than taking him back north of the border. Former Newcastle United keeper Wright praised the work done by Craig Harrison’s staff to date, and had high hopes that Watson would pull on a blue and white jersey again in the not too distant future. 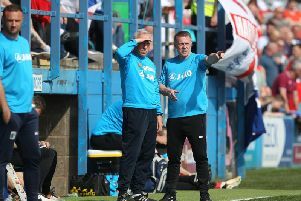 On the injury, Wright said: “Hartlepool are looking after it and are doing a good job. “They are hopeful that he might not need an operation and will try to rehab him for two or three weeks. “If he is able to step up his work after that, he won’t require an op. The area damaged is a non-weight bearing area and you can often get away with that. As long as he is pain free, he will hopefully be able to get through it. Pools will be keeping their fingers crossed that Watson is not required to go under the knife in the near future, as that would all but end his spell at the club. Watson has been outstanding since making the switch to the National League, appearing six times this season. In that time he netted once, against Maidstone United in a 3-1 home win. The defender was seen by many as the catalyst to Pools recent upsurg in fortunes, playing consistently through their run of four wins in five between August 28 and September 16. It is Mail Sport’s understanding that Watson’s parent club would be keen for the player to stay at the Vic, should boss Craig Harrison be happy to keep him. Should rehab be negotiated without any hitches, negotiations to extend his stay are likely to take place. Meanwhile, Harrison admits it is important for his players to stick together.